I wrote my master’s thesis in philosophy under supervision of Marc Slors and my bachelor’s thesis in artificial intelligence under supervision of Pim Haselager. I co-authored a book on an assignment for the Dutch national student union (LSVb). I also edited its second and third editions. 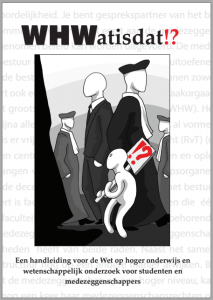 As of October 2016, it is in its fifth edition and is the standard handbook for student co-determination at universities and vocational learning institutions in the Netherlands. The illustration on the front cover was made by gifted illustrator, philosophy graduate, and close friend Jorrit Kiel. My Erdős number is at most 5. * I co-authored with Pim Haselager, who has an Erdős number of 4 through Johan Kwisthout and Todd Wareham. * Assuming the domain of co-authors may include non-mathematicians.